Questo numero è la quarta uscita di "Vetriolo". Quattro numeri, per una pubblicazione come questa, non sono certo pochi. 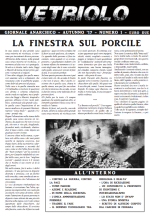 Un giornale che, piuttosto che accumulare e rinforzare certezze, crediamo abbia cercato di corroderle e farle crollare, ponendo nuovi dubbi e alimentando antichi interrogativi. Non certo per il puro gusto della retorica o della polemica, ma perché pensiamo che di "nodi da sciogliere" ve ne sono sempre parecchi. 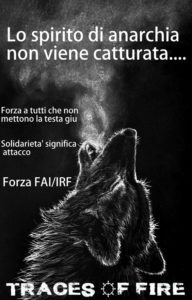 Allo stesso tempo riteniamo occorra riflettere ed analizzare, un difficile lavoro che certamente non è opposto alla corrosiva demolizione di certezze, ma che, anzi, vi è complementare. In queste riflessioni ed analisi abbiamo sempre affermato che la realtà non è un enigma incomprensibile, a differenza di quanto sostenuto da coloro che vorrebbero imporci la loro desistenza. Così, anche in questo numero si è tentato di analizzare la realtà odierna e, in particolare, lo si è voluto fare proponendo anche alcune ipotesi, oltre a proseguire con le riflessioni e le analisi che hanno contraddistinto i precedenti numeri sia attraverso articoli teorici più o meno estesi che di agitazione e d'attualità. Al lettore le proprie considerazioni. 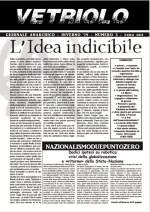 Ribadiamo e ricordiamo, ancora, che questo giornale non è né un asettico prodotto intellettuale né un contenitore di opinioni o di pareri. 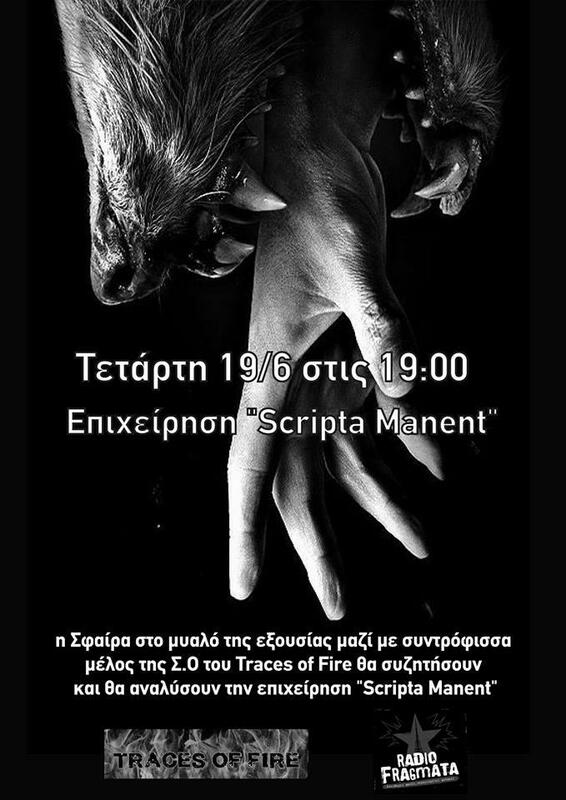 Proprio perché non intende chiudersi entro facili risposte, strillare soluzioni pronte all'uso o brandire tesi precostituite, si tratta di uno strumento che può implicare un vivo coinvolgimento con le idee in esso affermate, e questo lo auspichiamo sempre. 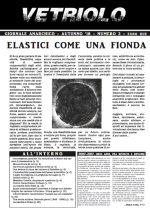 Infine abbiamo pubblicato il numero 1 del giornale anarchico Vetriolo. 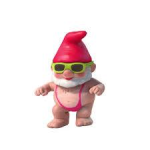 In concomitanza abbiamo anche ristampato il numero 0, per coloro che recentemente ce ne hanno chiesto copie, siccome esaurito da tempo. 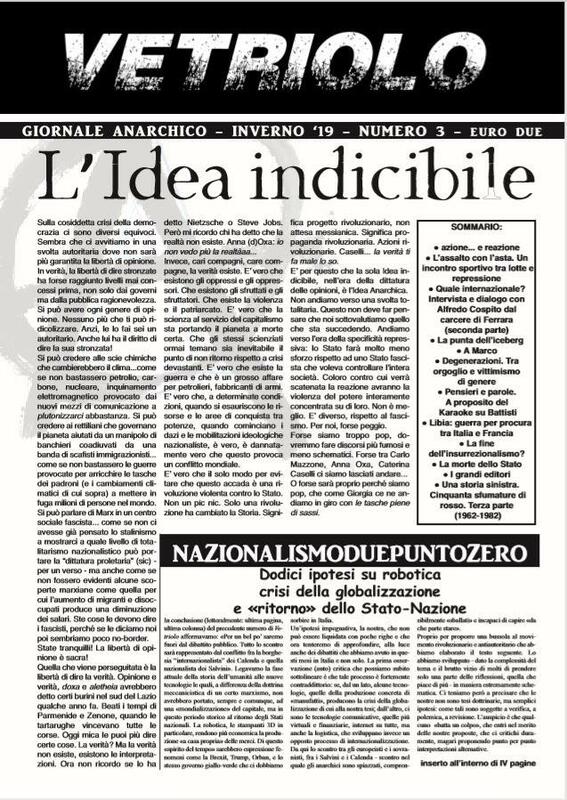 Dopo svariati mesi di censura è arrivato il contributo che il compagno anarchico Alfredo Cospito scrisse nell’inverno scorso per l’uscita del precedente numero; lettera che venne bloccata e sequestrata per ordine del giudice inquisitore Sparagna, mandante dell’operazione “scripta manent”. Una sola scelta, spalle al muro, continuare la lotta. Continuare con ogni mezzo a mia disposizione. It’s been a long while. 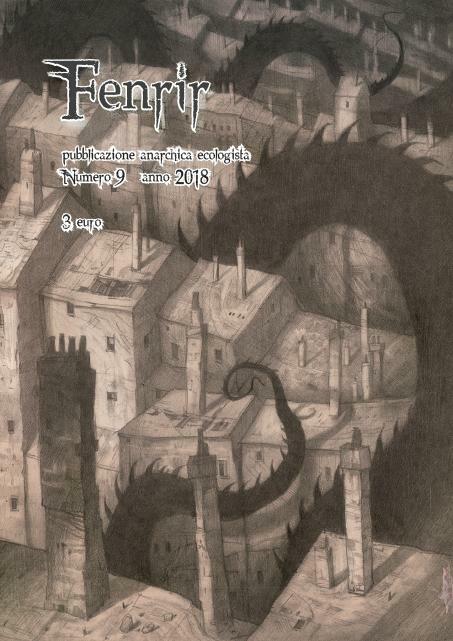 After a year we are publishing another issue of Vetriolo, issue number 2. We haven’t brought out the paper more frequently up to now, nor have we wanted to. Not that we didn’t have anything to say during this time, on the contrary. However we have never strenuously followed the possibility of giving a strict periodicity to the publication, which because of its form (with fairly concise texts of agitation, analysis and topicality as well as more extensive and complicated theoretical articles) is not suited to it. At the same time we’d like the paper to come out without long delays. 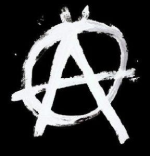 In any case we think that this paper is an important instrument for the anarchist movement regardless of the frequency with which it comes out. 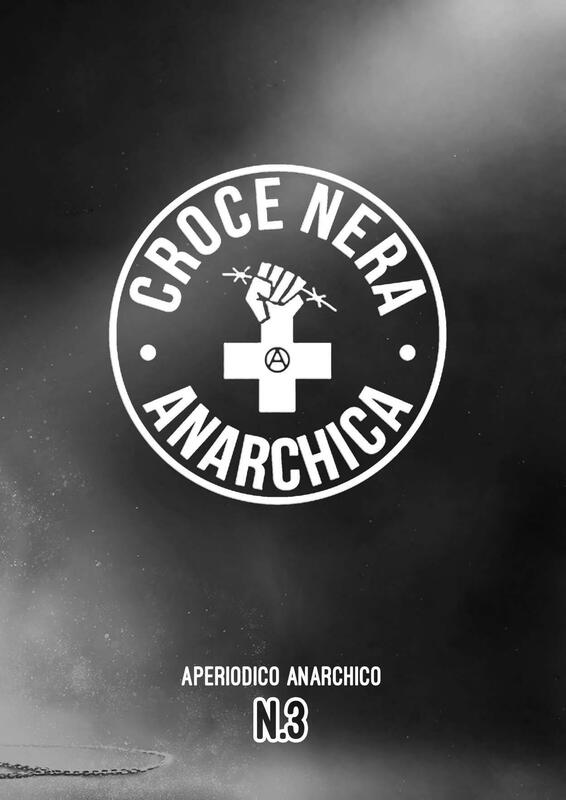 The pages of Vetriolo have always been and will continue to be a means aimed at discussion, dialogue and confrontation among anarchists. The paper will continue to give time and space to dialogue and debate among revolutionaries, including those who find themselves imprisoned. 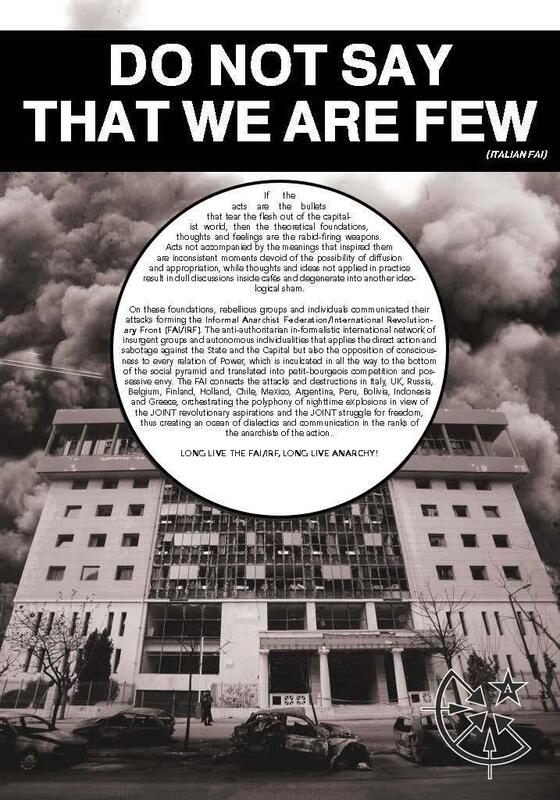 In this issue there are writings and articles by Marco, Anna and Alfredo, imprisoned following the arrests of the repressive operation ‘scripta manent’ of 6th September 2016. 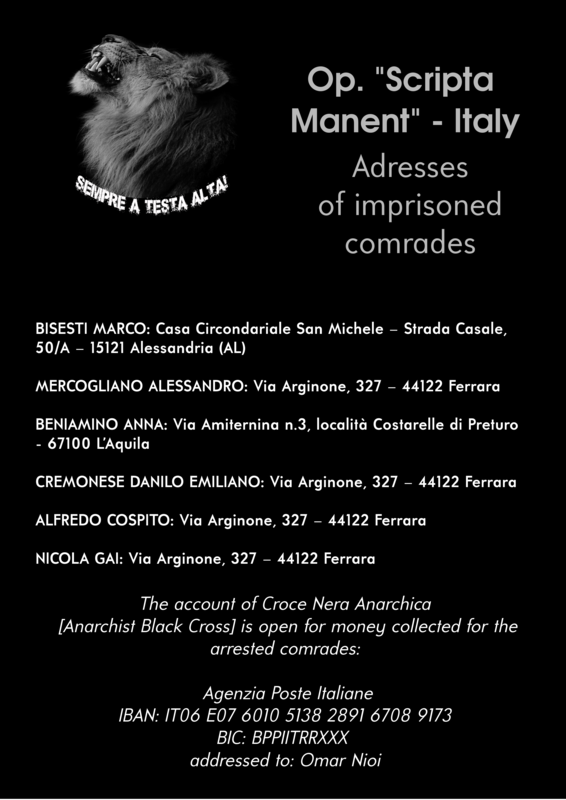 On May 3th, the anarchist Alfredo Cospito — prisoner in high security regime AS2 of Ferrara prison for the kneecapping of Adinolfi, CEO of Ansaldo Nucleare, and recently recipient of another arrest warrant for the operation “scripta manent” — started a ten-days hunger strike against the censorship that blocks most of his incoming and outgoing correspondence. 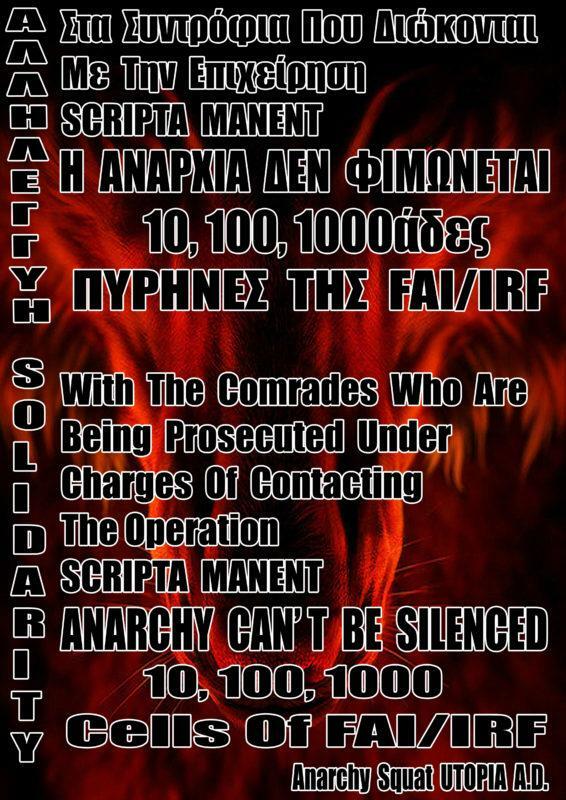 Alfredo is asking comrades to send lot of books, magazines, letters to support his hunger strike and break the isolation dictated by prison censorship. 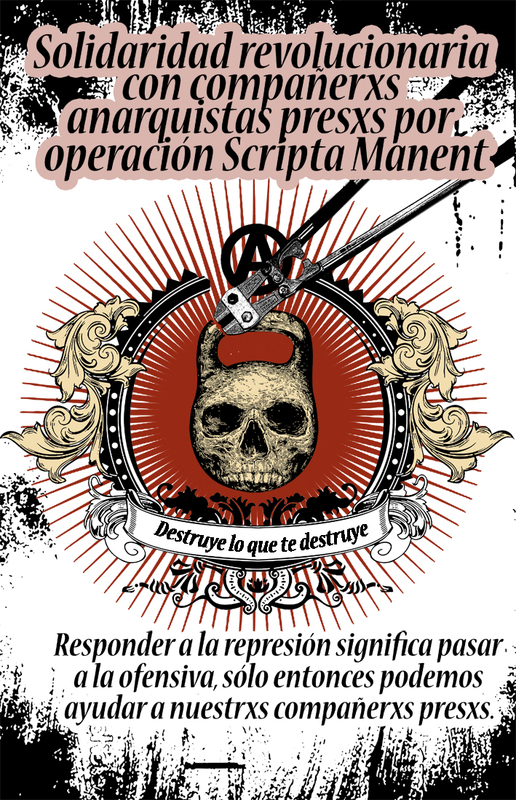 The prosecutor Sparagna from Turin is imposing the censor against the comrades imprisoned for operation “scripta manent”. In the last few months the censorship has become more stringent, and a lot of correspondence is systematically censored and blocked; books, magazines and any kind of stuff sent him almost never reach the destination. The censor struck also a text that Alfredo sent us in December, to be published in “Vetriolo”. In the same way an Anna’s text, for another publication, was seized in January. At the same time, not one single copy of our journal reached Alfredo and other prisoners: seized by guards, or frequently simply disappeared. It is clear that if isolation against comrades becomes more intense and so pressing is also, and above all, because of the censorship and the blocking of correspondence. 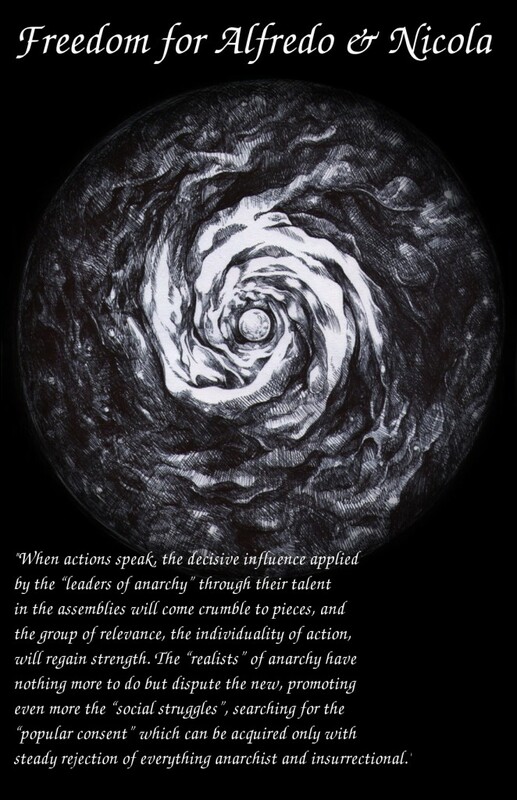 It is clear that the power can not tolerate that comrades contribute to the discussion between rebellious and enemies of authority. 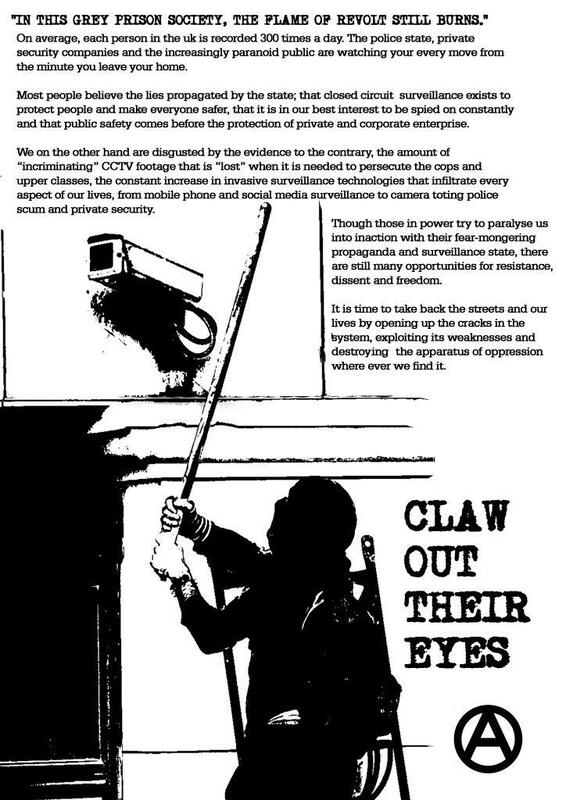 The miserable work of spying and the censorship are systematically intensified because the power presumes and imagines that it can annihilates and silences the anarchists in its prisons. With 30 years of charges on my back, it may seem absurd to feel the need to communicate projects and considerations. With the insistent censorship that distorts everything I write and say, it may seem stupid and mad to continue to resolutely communicate and write considerations lending themselves to censorship. 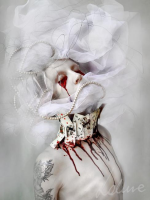 I need such stupidity and madness to feel still alive and participating. I have only one choice, back to the wall: continuing struggling, continuing with every means at my disposal. 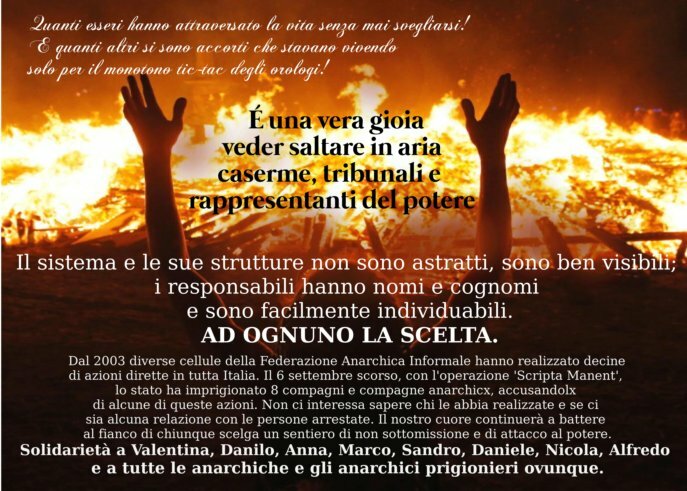 I got inspiration to write this text from the prosecutor Sparagna [in charge for Scripta Manent]; in his solitary “interlocutory — monologue” he claimed with ill-concealed embarrassment that he got us by process of elimination, by the “scorched earth” that the anarchist movement in Italy made around us. 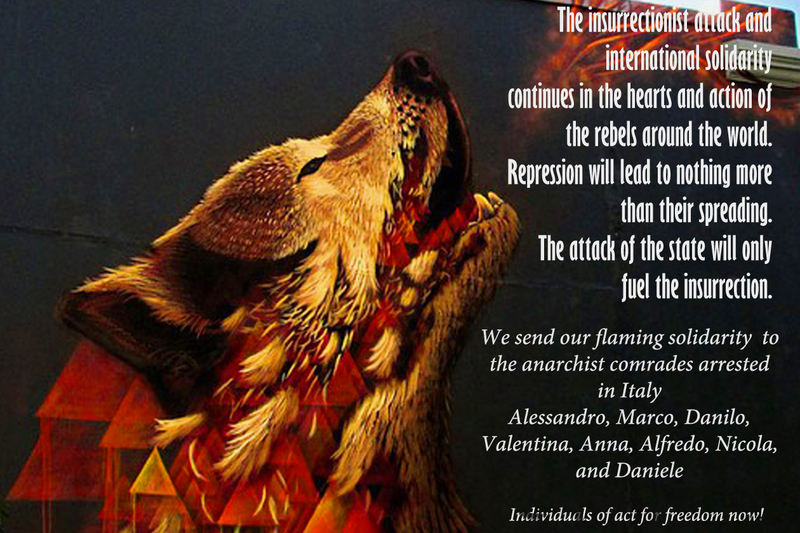 Is it possible that the anarchist movement here in Italy sank so low as to not feel empathy with comrades caught in a grip of repression, to think of us as a foreign body? The truth can not be found in the “specious” and stupid logic of a prosecutor from Turin. The truth is hidden in the folds, in different expressions of solidarity that have been addressed to us, in the opportunity that even a wave of repression such this one could give us. 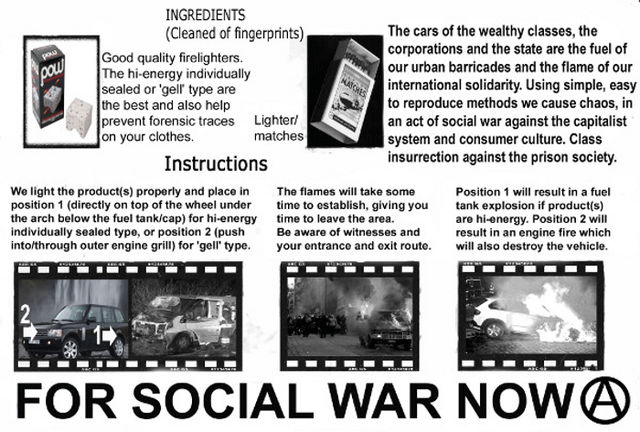 This is apparent from many actions expressing solidarity across the globe to us, this is apparent from a few but significant solidarity statements that we received. At first glance these statements may seem like the usual solidarity for appearances’ sake, but at my eyes they become fully meaningful. Maybe because of their origins, comrades with different projects, despite everything, were profoundly, directly, touched. Maybe because all these comrades are in some way part of this anarchism of praxis that keeps anarchy alive and kicking, and well reacting across the globe. For this and for many other reasons, those words of solidarity are no small things and can become an opportunity, especially if they can go beyond the repressive matter. 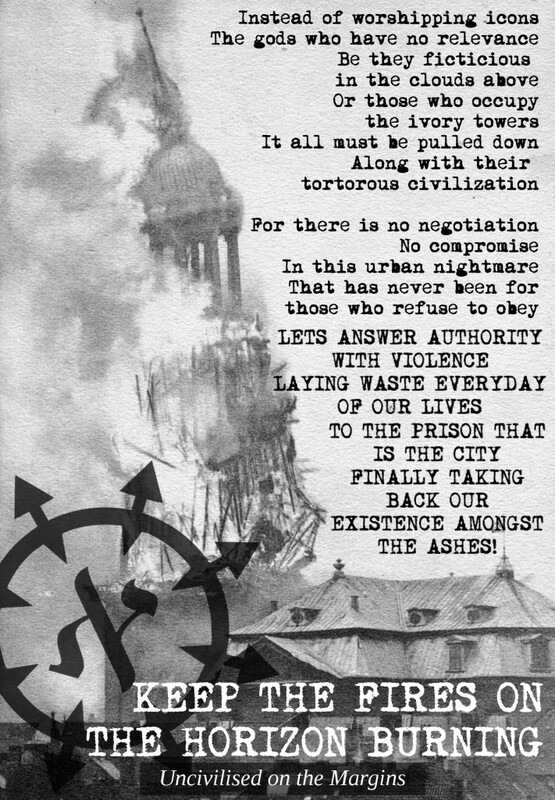 These are times when it seems there are big discussions about the issue of cities, urban areas, about the possibilities of revolt inside them (even of living), of their reformability. Big discussions frequently focused on various topics relating to struggles carried out by many opponents, antagonists, often reformists, sometimes even by enemies of every order and authority; among these issues there is gentrification, a word not so unusual anymore, a word we now want to express some thoughts about.